April 2017 could turn out to be one of the most important months in U.S. history that we have seen in a very long time. On April 6th, Donald Trump attacked Syria on the 100th anniversary of the day that the U.S. officially entered World War I, and now at the end of this month we could be facing an unprecedented political crisis in Washington. On Friday, members of Congress left town for their two week "Easter vacation", and they won't resume work until April 25th. What this means is that Congress will have precisely four days when they get back to pass a bill to fund government operations or there will be a government shutdown starting on April 29th. Up to this point, there has been very little urgency by either party to move a spending bill forward. It is almost as if everyone is already resigned to the fact that a government shutdown will happen. The Democrats will greatly benefit from a government shutdown because they can just blame the entire mess on the Republicans. But for the GOP, this is essentially the equivalent of political malpractice. The U.S. government is poised to shut down on Day 100 of Donald Trump's presidency, unless Congress can pass a new spending bill or a continuing resolution before the current one expires on April 28. Since Congress is currently on a two-week recess, there will be a sense of urgency to get a new bill passed once they reconvene on April 25. Leaders in both chambers would have four days to craft a new proposal that each side can agree on and get it on the president's desk for Trump to sign. Well, first of all, look at how difficult it was for the Republicans to agree on a bill to repeal and replace Obamacare. At this point, it doesn't look like that is going to happen at all. More importantly, any bill to fund the government is going to require 60 votes in the Senate. The "nuclear option" that the Republicans just used to push the Gorsuch Supreme Court nomination through is not available in this case under current Senate rules because a spending bill of this nature would not qualify. The threat from Senate Minority Leader Chuck Schumer and other Democratic leaders sets up a climactic first showdown with the president, particularly with their inclusion of Trump's signature border wall proposal. "If Republicans insist on inserting poison pill riders such as defunding Planned Parenthood, building a border wall, or starting a deportation force, they will be shutting down the government and delivering a severe blow to our economy," Schumer said in a statement. Up until now, Trump hasn't needed Democratic votes to stock his cabinet or advance the repeal of Obamacare, but a spending bill keeping the government open is subject to a 60-vote threshold in the Senate. It is a game of chicken between Trump and the Democrats, and I don't think that either side will give in easily. There are members of the Freedom Caucus that will absolutely not vote for any spending bill that includes funding for Planned Parenthood. But without the Freedom Caucus, there aren't enough Republican votes to get a spending bill through the House of Representatives. I don't see any way that a government shutdown is going to be avoided at this point, and the longer it goes on the more financial markets are going to get rattled. Meanwhile, we continue to get even more signs that a substantial slowdown has begun for the U.S. economy. Last week, we learned that only 98,000 jobs were added in March, and that was only about half of what most analysts were expecting. At the same time, the Atlanta Fed's GDPNow forecasting model is now projecting that U.S. GDP growth for the first quarter of 2017 will be just 0.6 percent on an annualized basis. That is absolutely pathetic, and as I have said before, I wouldn't be surprised at all if we actually end up with a negative number for the first quarter. If we do indeed get a negative number for the first quarter and that is followed by another negative number for the second quarter, that will mean that a new recession has already started right now but we just haven't gotten official confirmation yet. And lots of other things are already happening which have not happened since the last recession. For instance, this is the first time since the last financial crisis when there has been no growth for commercial and industrial lending for at least six months. In December, bankruptcy filings rose 4.5% from a year earlier. In January they rose 5.4%. It was the first time consumer bankruptcies rose back-to-back since 2010. I called it "a red flag that'll be highlighted only afterwards as a turning point." If you would like, I could keep talking about the bad economic news for a couple thousand more words. U.S. credit card debt has just surpassed the one trillion dollar mark, a major crisis has arrived for the U.S. auto industry, thousands of retail stores are closing all over America, our pension funds are underfunded by trillions of dollars, and the U.S. national debt is now sitting at a grand total that is just shy of 20 trillion dollars. 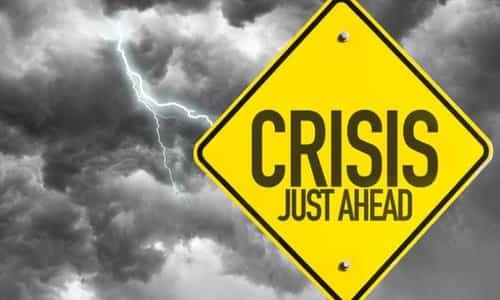 The only reason that we have not crossed that 20 trillion dollar mark yet is because the debt ceiling deadline has already passed, and that is another thing that Congress needs to address very quickly if they want to avoid a major crisis. Unfortunately, a U.S. aircraft carrier strike group headed by the USS Carl Vinson is heading toward North Korea right at this moment, and Russia and Iran are promising to "respond with force" to any new U.S. attacks on Syria. Those that were hoping for some sort of "reprieve" under Donald Trump can forget all about that now. The pace of global events is really starting to accelerate, and the U.S. is already in a more precarious position than it was at any point in 2016.